Bosses runs weekly specials in all locations! We have the best pizza specials and beer specials in Texas. Sunday and Monday you can receive $2 off any large (16″) and Big Boss (19″) pizzas. Available for dine in, carryout or online ordering through our app. Tuesday is our famous $10 Tuesday! Any medium 12″ pizza for only $10. This offer excludes Cheesesteak and Lasagna pizzas. Build your own pizzas or order one of our specialty pizzas! Try a different pizza for each member of the family! Wednesday is our $5 draught beer pitchers. Any draught beer we have is available in a $5 pitcher. Pairs great with any appetizers like potato skins or fried cheese. Be sure to stop in and see us and claim some awesome specials! There is a 10% off coupon under our Specials tab. 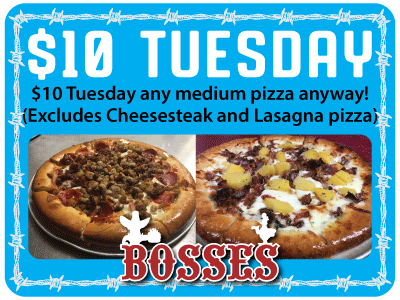 With great pizza specials and homemade Ranch and Red River Ranch, Bosses is your new favorite place!